NATURAL HAIR UPDATE: 2YEARS 1MONTH! Hope you’re doing great, I just realised that I’m 2 years, a month and a week natural today, and an update is only right. I get a lot of questions about my hair, its care and my regimen. In the past, I have tried to make videos, write posts and answer questions via my social media accounts, But I guess when it comes to hair, we enthusiasts always want to know more. Hence this post. I would try to divide this post into sections and answer all questions I have gotten over time. All points/answers are solely what has worked for me, I am not an expert, take all with discretion. 1. WHY NATURAL? : I have cut my hair thrice before this, just for style purposes i.e the ‘Anita baker’ kind of hair cut, but it never lasts. The back grew back and I to re-trim it almost every 2-3 months. On the last occasion, I just decided to take it all off. My friend Biola was actually the one who ‘enticed’ me with the natural hair movement. I first wanted to keep it short, i.e like month 2 as seen above, but when it started growing out, I quite liked the texture, so I let it be. 2. REGIMEN: My regimen has changed drastically over these past two years, when I first went natural (1st 4months) I washed my hair every day i.e shampoo & condition, I loved the feeling under the shower. I deep conditioned twice a month then, using raw eggs mixed with mayonnaise or a deep conditioner/cholesterol. Nowadays, I wash when my scalp itches which is averagely about 3 times a month. However, I try to deep condition once a month with my Organics olive oil deep conditioner. It’s been over 6months since I did the egg-steaming process. I oil my edges every night with peppermint oil now, in the past I used Jamaican black castor oil for that, but I stopped because I wasn’t seeing any visible-tangible growth. To oil my scalp, I use Olive oil and Coconut oil interchangeably at least thrice a week. I also do oil rinses occasionally now,( when you wash your hair with just only oil and rinse it out with water). My oil of choice for this purpose is also Extra Virgin Olive oil. I do not use any supplements or vitamins for my hair growth since embarking on this hair journey, but I intend to try out Mane choice vitamins from next month. 3. PROTECTION: Maybe because of where I live and the weather situation, I do not wear my hair out. I am 98% of the time on wigs. For the past one year, I have only installed a weave directly on my scalp once, which I regretted. On taking out the weave & tracks my edges went with it. That was like a lesson for me, my natural hair hates tension, so I simply weave my hair back in about 6 conrows loosely and wear wigs. 4. STYLING: On days when I decide to wear my hair out, I wear it as a ‘Fro’, a bun or a quiff with a low bun. For the fro- after washing, I plait my hair as usual, when dry I comb it out. On days I’m in a hurry, I blow it out with a blow dryer on medium-high heat using Argan oil as a heat protectant (grape seed oil is preferable). When I style it as a bun; from wet hair, I apply some Shea butter and Organics carrot oil cream, which serves as a moisturizer. This cream revives my curl pattern and gives it that ‘wave effect’. For a sleeker look, I apply my Eco styler gel around my hair and style into a top bun. I use a cut-out pantyhose/stockings to place my hair in a bun. Regular hair ruffles break off every time I try, due to my hair’s thickness. However, when my hair is dry I do the same process to form a bun but I slightly mist it with water from my spray bottle for manageability. 5. STRAIGHTENING: I’ve straightened my hair quite often so far, I currently use a Remington straightener which is quite perfect for me. My blow dryer is the Nicky clarke-Vitesse. To blowdry, I first blow out my hair mildly from damp(NOT WET) hair, after which I apply shea butter for shine and thickness, then heat protectant before I straighten. My hair is relatively soft, so it’s not compulsory I use the chase method to get it bone straight. as seen below. This was about 5weeks ago. 6. LENGTH RETENTION: Growing long hair is dependent on many factors. e.g Genes, Diet, hair habits, care and most of all patience. I can’t really say I have long hair genes, but most women from my mum’s side of the family do. I remember my mum having almost mid back hair while I was growing up before she cut it, so I feel genes may have contributed to my growth rate. Although I myself do not relent in my care efforts….. I hardly manipulate my hair, more than often I’m in a protective style. I try to wash often and give it the appropriate TLC, but nothing out of the blues. I am not of the opinion that products solely make your hair grow. Yes, some products help the growth process but majority of growth comes from blood flow to the scalp. A good diet, exercise, scalp massage, stimulating oils e.t.c help that process. 7. 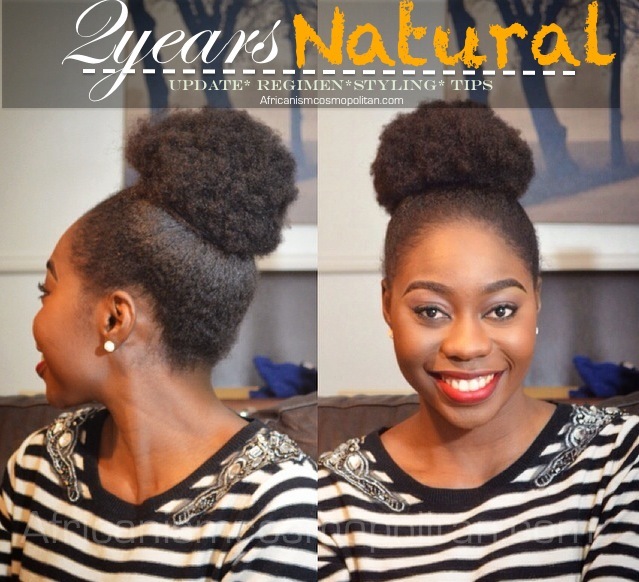 BREAKAGE: I used to have serious dandruff and lots of breakage but over time that stopped. I was able to combat that breakage using protein treatments (deep conditioning) and a healthy diet. I am also over due for a trim this year, but I will do that in a professional salon, I do not have appropriate cutting shears which I think is important when cutting hair. Furthermore, I do not allow people who aren’t familiar with natural hair textures to touch my hair. I haven’t been to a salon this year because my last experience was awful. I’ve been D.I.Y-ing my way ever since. 8. PRODUCTS: I have discussed my staple products in this Video, please watch for adequate details. My shampoos are Pantene Pro-V and UrCurly soya shampoo. I use Conditioners from Ori essentials and Herbal essence’ hello hydration. I’ve been using these for a while and my hair likes it. I use Organics edge control, deep conditioner and carrot cream. My essential oils include Olive oil, Emu oil, Peppermint oil, Coconut oil and Argan oil. I rarely try out new products because what I use presently serves the purpose I need it for, if the need arises to try out new items, I would indulge. When it comes to hair I think its best to keep it simple. The use of too many products could cause a lot, e.g buildup, reaction and redundancy of key products, as its been watered down by other products. My suggestion is to find what your hair likes and stick with it. 9. EDGES: When I was relaxed, I never had a problem with my edges, I’ve always had full hair as long as I could remember, till about some months before I went natural. My hair was due with undergrowth and I was clueless on how to care for it during the transition. I relied on braids, which snatched out most part of my hair, although it wasn’t obvious, I knew my edges had become sparse in comparison to before. 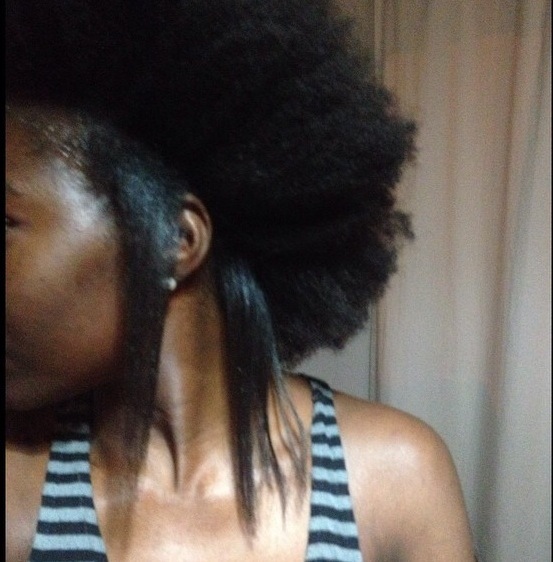 After going natural they grew back…then left again thanks to Dr. miracles temple and nape gro balm. I think I was reacting to the product but my complete review and explanation is also in this video below. Now, to revive them I use emu oil and peppermint oil interchangeable and I’ve noticed substantial growth. 10. PATIENCE: I’m often asked about all the above, but I feel the most important factor is to be patient as I often say. Hair is good but do not obsess over it. Slow down with the tape rules or length checks, just take pictures if need be, periodically e.g every 3-6months and compare results. You live with your hair everyday so you may not notice daily growth. But in retrospect, you’d realise it’s actually growing. Some faster/slower than others but all in all, it grows if healthy. 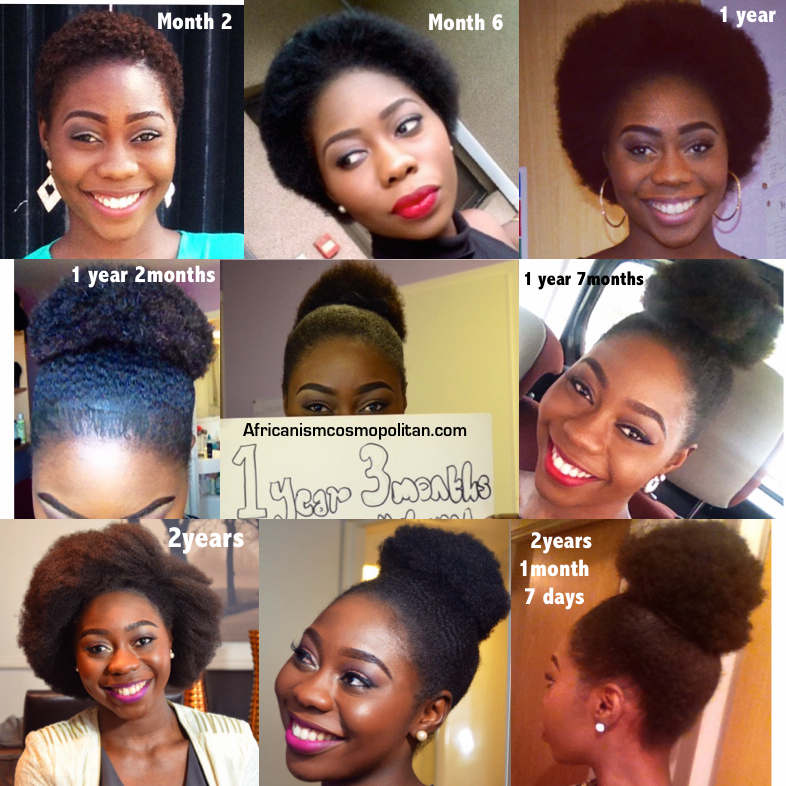 I see some other naturals with 2 years hair growth and I’m marvelled. Some have hair almost mid back in only two years, but then again I know we are different people so I try not to compare or sulk. It’s best to just enjoy every stage of being natural. I feel I had fewer hair struggles because I embraced each stage. I rocked my T.W.A’S( Teeny weeny afro) with pride and my huge Fro’s as well. With hair, beauty and everything else in that genre; patience, care, contentment and appreciation is the best gift you can give yourself. I wish you all the best in your hair journies….more growth and less challenges. P.S. Remember you can pray about everything, including your hair….God cares . ← HAPPY BIRTHDAY PEACHY KEMOG! I went natural mostly because of you, i remember when people asked how i’d look on low cut i just show them you pictures . i’ll be one year by December (Happy about my growth tho) ,your hair(My hairspiration ) is growing beautifully. Ditto at the prayer comment…my cousin has really really long hair and when I asked for tips, prayer was one of them. God really cares about everything, no matter how inconsequential. Also on the natural hair journey, patience is my problem now but I must learn. Lol. Recently stumbled on your blog, love it! awww thank you so much…. I appreciate your comment so much and prayer is so key, I can’t begin to emphasise the importance. Thank you again for following. Inspiring natural hair story. Happy Anniversary. 🙂 Enjoy your day! I love your progress! I today makes me 6 months post third big chop and im excited for my 1st year anniversary! Im a wig wearer also , so I can attest to the length retention 🙂 can’t wait to see year 3! Aww thanks for stopping by!! oh yes I can’t wait tooo ^.^ wig wearers rock!! you’re welcome and yess we do!! ahaha 🙂 Thank you following me as well!!! I do love your blog ! Hello dear, no I don’t wash my hair in weave often, I think I’ve only done it twice. I just go under the shower and wash the tracks, and make sure I blow dry thoroughly. But now I know better, it’s not a wise choice. The braids underneath get loose and the hair may smell if damp. I needed to read this. Lovely and insightful post! Great post! I’m one year natural and 4 months post big chop. Your post is very encouraging as well as your hair growth. Thanks for the timeline pics and the suggestions to take pics of your own to see the growth. I’m working on patience, but in the meantime I’m enjoying my new texture and the awkward stage. Take care.